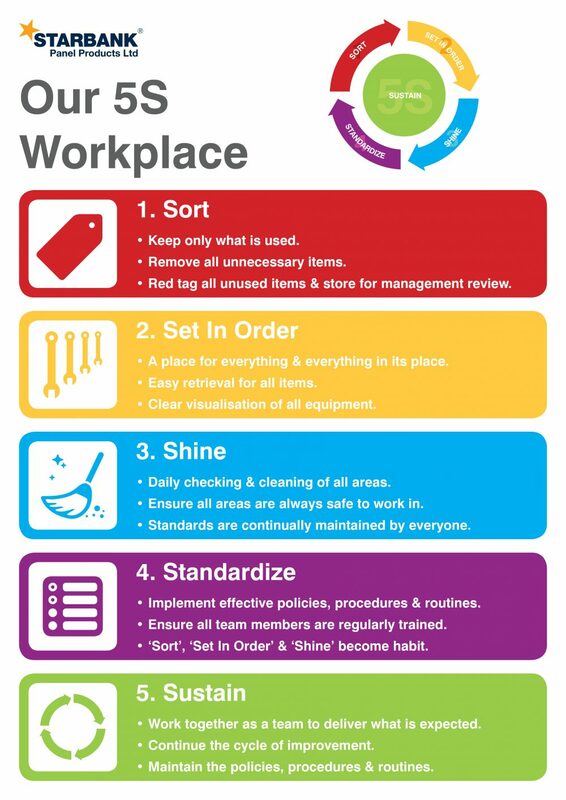 The goal of the sort phase is to eliminate everything in your workspace and department that is not needed. By doing this in our factory and office, it will create more space as we aren’t storing unnecessary items, as well as reducing any potential time wasted trying to find things amongst items of no use. The Set phase ensures that there is a place for everything and everything is in its place within your workspace. The set phase must ensure the workplace is visual, so it is clear to everyone if an item is not where it should be. This stage helps to improve productivity as everyone knows where things should be kept, they can easily retrieve, use and replace them. The shine phase is about initially doing a deep clean of your area/ department and then maintaining it through daily cleaning and maintenance activities. This ensures that all our areas are clear and safe to work in, reducing potential accidents and helping to improvie the quality of the products we make. The standardise phase is about implementing effective policies, procedures and routines to ensure the Sort, Set and Shine phases are continually achieved. In this stage we will review all our SOP’s and update them where necessary to ensure we are all doing our jobs the most efficient and effective way. The final stage is the sustain phase. This is ensuring the successful integration the 5s mindset amongst our teams. It is also about making improvements, preventing fallback to old ways, reviewing the improvements and then making further improvements. This is the continuous cycle of 5s as it isn’t just a one time thing. Our overall goal is to make improvements on the seven areas of waste that include: over production, inventory, waiting, over processing, motion, transportation and reworking. If we can make improvements in these areas it will not only improve our production and office facilities but it will help improve our customer relations and the products we produce.